The Crowning of Louis: A New Translation of the Old French Verse Epic is an epic poem of the William of Orange Cycle, translated from the Old French by the independent researcher Nirmal Dass.Written around 1130, Le Couronnement de Louis recounts Count William Shortnose’s many battles in defense of Pope Hadrian I and King Louis the Pious. Count William, like Roland of The Song of Roland, is a great warrior who protects the young king-elect Louis from traitors who wish to take the throne. At the same time, the Saracens seek to overthrow the papacy and win Rome. This epic poem is chock full of insults and bloody battles fought int the name of God and King. The Crowning of Louis is an obscure epic poem that I borrowed from my university’s research library. While there is nothing outstanding about the story itself, I definitely enjoyed the poem. I started reading it at a coffee shop, but I had to leave after reading the first few pages because I couldn’t stop laughing. So many scenes read like something from the movie Monty Python and the Holy Grail. In one battle scene, King William lops off his opponent’s limbs, but, out of mercy, doesn’t kill him. Instead, William and the king embrace each other and depart in peace only to meet again later on horseback! Clearly, the poet had amnesia. The pope’s first challenger, King Galafrez, refers to the Bishop of Rome as the “great lord of the large hat” (vs. 475). King Galafrez promises him, “I shall roast you over coals in a hearth/ Till your liver falls on the heap of coals” (vs. 542-543). The humor is sky high. 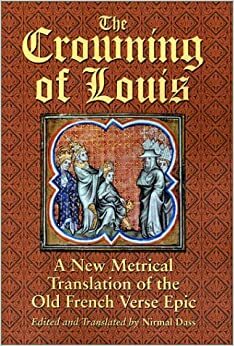 If you like Medieval battles, you will enjoy The Crowning of Louis. Unfortunately, there are no new copies available online. However, there are some cheap, used copies available on Amazon. It’s amazing what the characters are willing to do in the name of God. “Saint Peter, lord, protect now your champion. If he dies, you will be badly reproached. Thank you for the award 🙂 I did one a while ago, but the questions are all new, so I will post my answers soon.